January 15, 2016. netomat is proud to again be the mobile partner for New York City’s hugely popular NYC Restaurant Week campaign. 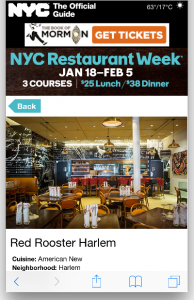 In partnership with NYCGO.com, the official marketing, tourism and partnership organization for the City of New York, netomat has again built, launched and hosts the 2016 Winter Restaurant Week mobile web app. netomat has been NYCGO.com’s mobile partner for eight years. During that time, netomat has designed, developed and hosted the beautiful NYCGO.com mobile website as well as dozens of mobile web campaigns including Restaurant Week, Broadway Week and Off-Broadway Week (all campaigns are registered trademarks of NYCGO.com). NYC & Company (nycgo.com) is the official marketing, tourism and partnership organization for the City of New York, dedicated to maximizing travel and tourism opportunities throughout the five boroughs, building economic prosperity and spreading the positive image of New York City worldwide. For additional information about NYC Restaurant Week Mobile or to partner with netomat for your website, mobile web, mobile application or social media campaign, please contact us info@netomat.net. Eat Up at NYC RESTAURANT WEEK! netomat is proud to have partnered with NYC & Company, New York City’s official marketing, tourism and partnership organization, on the launch of the NYCGO.com Winter Restaurant Week 2014 campaign, Eat Up! With nearly 300 of New York City’s best restaurants participating, NYC Restaurant Week offers NYC residents and visitors access to lunch or dinner at some of the finest restaurants in the world at amazingly affordable prices. 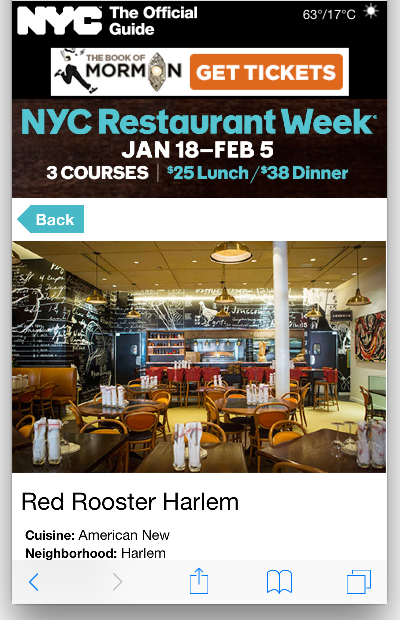 Go to the Restaurant Week mobile website (powered by netomat) on your mobile phone at http://m.nycgo.com to find a participating restaurant, check out the menu and to make a reservation. Restaurant Week is running now through March 7, 2014. NYC Summer Restaurant Week 2013 on your mobile phone! Go to www.nycgo.com/rw on your mobile phone to make reservations and eat at some of the finest restaurants in the world at a fraction of the price you would normally pay! With the NYCGO mobile web app powered by netomat, you can search for participating restaurants by neighborhood, by cuisine or those closest to you. 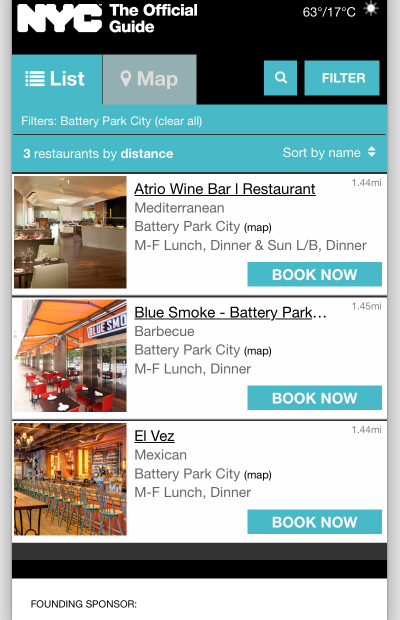 Check out restaurant descriptions, menus and make reservations all from your phone. New SEE INSIDE feature: For several of the participating restaurants, you can now click on See Inside (powered by Google) and do a virtual walk around inside the restaurant before you go! What are you waiting for? Go to NYC Summer Restaurant Week 2013 now and grab your reservation! P.S. if you think you’re going crazy because the colors keep changing on the site, you’re not!